You are what you don’t eat. Food is central to our sense of individual and social identity. We consume our identities through the food choices we make; what we incorporate and exclude from our diet helps to frame our social and cultural lives. The inverse of this is true as well; what other people eat is one of the ways that we understand their identity and what social and cultural groups they belong to. To some extent, my previous post defined the role of eating with identity. For those that have not yet had the time to digest this, I’ve been talking about the role of food from both the traditions of what we eat with in the form of cutlery, and that what we consume contributes directly to our personal and social identity. Claude Fischer makes the important distinction that we have “invented” cuisine. As omnivores we can eat many different foods, but a cuisine is a shared set of rules that ‘helps it assert its diversity, hierarchy and organisation, but also, at the same time, both its oneness and the otherness of whoever eats differently’. Therefore, cuisines are highly semiotic with underlying structural meaning and many symbolic connotations. In the modern world, culinary-tourism is one of the ways that we explore other cultures. It’s also logical to infer that we all contribute to cultural-identity through our decision and that culture provides the context from which we make decisions. There are national foods which are clear ‘signs’ of a culture; there are iconic dishes that have become stereotypical expressions within the global culture. “Cuisine is not so much a matter of ingredients, transformed or not, as of classifications and rules ordering the world and giving it meaning. The foremost classification is of course the one which divides the universe into what is food and what is not. These edibility codes are so powerful because they stand at the boundary of ‘nature and culture’. What makes an ape a civilised human? What we do tend to find are systems of oppositions that are organised around social or cultural identities. Social cohesion is often created by exclusion rather than inclusion – ‘we’re not like those people’ is easier than defining what you stand for. Semiotically this is expressed at a structural level in a whole series of oppositions through society and culture. An example here is illustrated though the pizza traditions of New York and Chicago. While the pizza tradition owes its origins to Italian immigration, in a relatively short period of time the New York thin crust is set in opposition to the Chicago Deep-dish pizza. Each type of pizza have their own traditions and rituals of toppings, condiments and eating styles. Something that Jon Stewart as an NYC resident frequently rallies against. While these internecine culinary battles are entertaining to map out, sometimes these conventions of identity can also bring re-assurance. Ethnic food preferences become identity markers when one goes abroad. When you travel through the Mediterranean you see food outlets offering food tailored to the English; though South East-Asia Aussie friendly café’s proudly display signs saying ‘vegemite’ here. 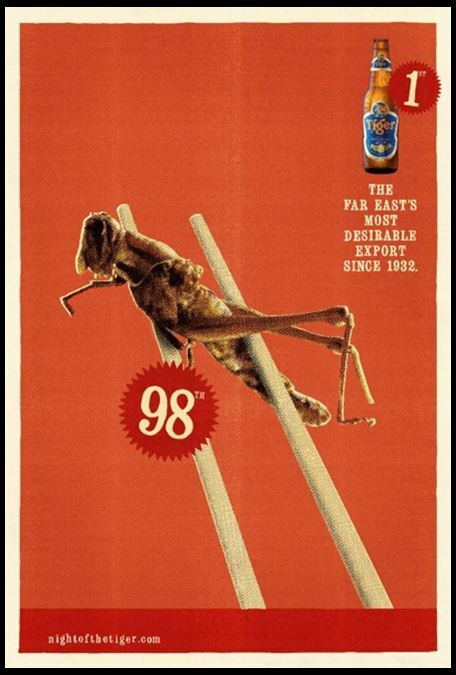 A few Australians that I’ve spoken with that haven’t enjoyed this polarising smear have been converted, out of homesickness, to eating the iconic spread whilst overseas. When you say ‘western’, it’s as limited and stereotypical a statement as saying ‘eastern’. With this is mind, I’ll take a leaf from my last post and talk about east and west in generalised terms. In discussion, Western culture is a vast mixing pot of cultures which makes some comparisons more tenuous against more established and consistent food traditions. Western or eastern understandings of each other’s cultures are influenced by restaurants. Restaurants can seek to act as a source of cultural translations or they can be sources of authentic cultural experiences. What do we really know? Some of these local ethnic food traditions are often thought to be authentic, such as General Tso’s Chicken or Fortune Cookies, but are not. So what is authenticity when we speak of cultural traditions? If we’re all more sophisticated apes, are our senses culturally different? There isn’t scope here to explore aspects of every sense used in eating. So, it’s informative to take a brief look at the experience of food through one facet of our visual sense. Focusing on colour can assist in highlighting some of the many cultural differences that have to be accounted for. Firstly, it is worth noting that the Sapir-Whorf Hypothesis states that from a linguistics perspective, there are certain thoughts of an individual in one language that cannot be understood by those who live in another language. While challenged, it is accepted that language can have a slight or moderate effect on the senses.. The reason this is worth noting is that not all cultures have the same number of words for the colour spectrum. This might influence the way that cultures react in this area. Semiotically, we are encoded to view the same food materials in different ways. Furthermore, there are different cultural associations with colours. 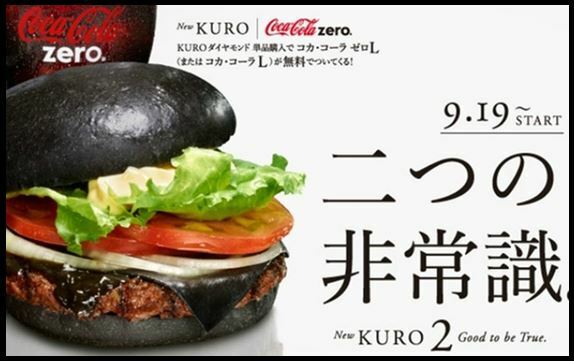 For example, the recent Kuro Burger was a hit in Japan but was met with consternation and fascination in the US. There are definite cultural differences in color meanings and associations between the U.S. and Japan. Here we associate black with death (unlike the Japanese, who associate white with death) and might think that black food is molded or spoiled (i.e., dead and inedible), or else associated with the flavor licorice. The Japanese, on the other hand, are used to eating black seaweed, fermented black bean-paste-based foods, black walnut powder, squid ink, and a lot of gray, muted-colored foods, so a black burger bun and cheese would not seem too alien to them. In fact, they reserve subtle, soft grays, blacks, and muted hues for packaging for their own local Japanese-made foods, and associate bright, loud, primary colors (reds, yellows, oranges, blues) with foreign, Western food packages, whose people they consider to [be] brash and loud. Research has demonstrated that the relationship between visual perceptions and food colours are very close. Importantly, people prefer food colours that match their memories. It’s also clear that even subtle shifts in colour can affect perceptions of taste, smell and flavour. Some of these colour perceptions are what you would expect from nature; red being associated with sweetness in ripe fruits, and green unripe fruits suggesting tart or sourness to the taste. This association with colour speaks not only to the link between flavour identities but also of intensity. Garber et al. (2008) point to the influence in new messages from marketing in creating a link between blue colouring and raspberry flavouring over a relatively short period of time, indicating that we can, as consumers, be reprogrammed. There are other category conventions in snack brands, such as purple meaning salt and vinegar, green meaning chicken, and blue meaning plain salt. When new brands play with these codes they lead to consumer irritation since they impact on navigation. The influence of colour on taste can come from elsewhere in the eating experience: ‘the brain integrates visual input (such as color), not only from the food itself, but also from the container, packaging or plateware from which it is being consumed’. This is clear from the Kuro burger example that is discussed above, where the eastern and western connotations of colours created different understandings of what the food experience would be like. A consideration here is that even when we are in charge of all our senses, we are often fooled by context and labels. Edward Dolnick has documented a series of studies where one sense can over-ride our sense of what is real. “…news of the great fish fraud broke recently, New York’s elite restaurateurs rushed to defend their sushi. Phony labels on the red snapper? Knock-off tuna? Not to worry. Top chefs can’t be fooled, they insisted, nor can their customers. “It is impossible to mislead people who have knowledge,” declared Eric Ripert, the chef at Le Bernardin”. But they were. Recently in an Australian Craft Beer Festival an overt mainstream beer won a craft beer prize in different clothes, exploiting the same principle that the tongue follows the mind. Before looking at some of the interesting differences between east and west cuisine, it is worth staying on the sensory level for a moment. Recent research has been able to look at the chemical differences of eastern and western food tastes. This is important because your palate is trained from an early age to certain flavour expectations. A recent study by Ahn, et al (2011) looked at why western and eastern foods taste differently. The study has suggested these differences come down to chemistry. 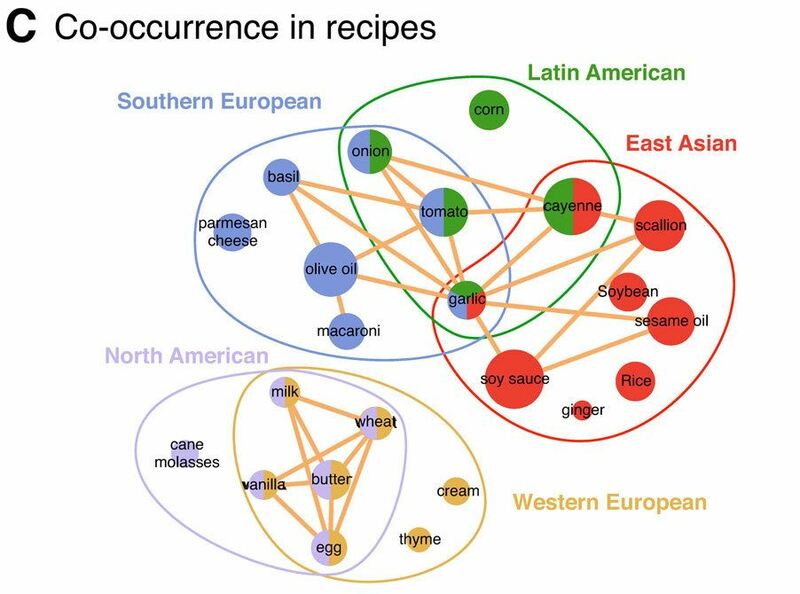 They found that Western food seeks out ‘food pairs’ with matching chemical tastes. Whereas, Asian food is the opposite of this pairing – the aim here is to avoid pairing ingredients that share flavours. The more flavours that two ingredients share, the less likely they are to be used in Asian cuisine. Whereas, thirteen prime ingredients (butter, eggs, milk, etc.) appear in 74.4% of North American dishes. The co-occurrence of the more common ingredients is illustrated below. 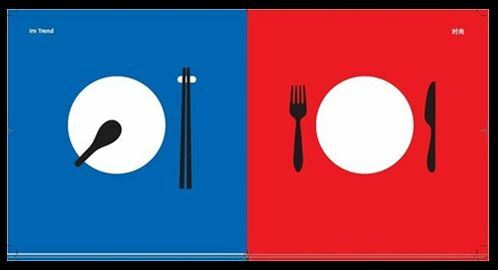 The logic behind food pairing is guided across many Asian cuisines by a belief that within a meal there is a need to balance the forces of “yin” and “yang”. Foods are considered to have cold or hot properties, and foods of both types are often served together in balance for good health. The following is a summation of some of the key differences of western and eastern cuisines. There are many more, however, these are representative of the four stages of making a meal. It is essential at the outset to notice that, while Western diets include a good deal of fermented dairy produce, especially cheese – of which we have a staggeringly large variety – pickled fish, meats and vegetables, and cereals (just think of the hundred-plus single malt Scotch whisky brands, and thousands of beers and wines), “the lack of fermented legumes in Western culinary traditions seems slightly puzzling at least”. Eastern culinary cultures also make use of fermented cereals, vegetables and foods of animal origin. Fermented legumes may seem simply to be a bonus, until we explore exactly what they are, and begin to realize that they are central to the cuisines in which they feature. Whisky expert Jim Murray awarded a record-equalling 97.5 marks out of 100 to Suntory’s Yamazaki Single Malt Sherry Cask 2013, hailing it as “near indescribable genius” in his comments in the forthcoming 2015 World Whiskey Bible. A much older fermentation borrowing is Worcestershire sauce, which is a variation on a Indian fermented fish sauce (anchovy) recipe that are valued in eastern cooking. In western diets we tend to store and purchase frozen goods. Whereas, many eastern products are stored by being pickled, removing the need to keep them refrigerated. In shortcutting meals, a western approach is to buy frozen meals for convenience; eastern practice is more to buy food that has been partly prepared. Shopping for food in the western world is largely a solitary one (mums won’t forgive me saying this), but in comparison, buying the daily food in many eastern cultures is a communal and social active process. ‘Street Food’ is a more regular part of life. Eastern cooking tends to be based around vegetables and grains; whereas Western traditions are focused around the protein, with vegetables and an accompaniment. This has influenced the evolution of supporting cutlery, as discussed previously. Western cooking is measured and is relatively technical; Eastern cooking is more based on intuition and the ‘rule of thumb’. Eastern cooking can start with a live or whole animal – often involving the butchery of the animal at home. Western cooking outsources the butchery. Western cooks struggle to know where their cuts of protein come from, whilst eastern cooks are more conscious. Cooking implements reflect this difference. Eastern food is cut up into pieces that can be manipulated with chop sticks. Western food is often cut with a knife and fork so that it can be eaten. There are ‘flavour principles’ that Rozin, et al. has identified that certain olfactory and gustory complexes of a given cuisine; for example the flavour-principles of garlic/tomato/olive oil in Italian food or Sweet/Sour/Chilli in Thai food. Eastern cooking is generally more concerned with aesthetics than Western. In China, the notion of mei-shi (lit., beautiful food; i.e., gourmet food) is almost a household word. Foodie culture has only relatively recently been mainstreamed in the West. It can be argued that in the arena of luxury food, this is not true for all of Western cooking. Although as Cutler, et al. has stated ‘while verbally projecting an image of culinary hauteur, many Americans are also cooking less and eating processed food more’. In western cultures, eaters are organised around tables and we sit in chairs. In eastern traditions, eaters will sit at group level or at tables. In the Western setting the individual will often eat from their own plate – the setting distancing us from other eaters. Cutlery is also a way of distancing the eater from their food, compared to eating with one’s hands. There is also a much more delimitated space between the kitchen and the eating area in Western meals. In eastern meals often you sit around the cooking pot. In Eastern traditions, the setting is communal; here the host shares the meal amongst the guests. The function of the shared meal is to bring people closer through sharing a common dish. A more complex form of this symbolism is the Catholic communion ritual is communal – it demonstrates membership to a community of believers through symbolic food and drink. In eastern eating traditions, likewise, the individual fits into the eastern setting, reinforcing the role of unity and family. A difference that most people would have experienced through a Chinese banquet or similar meal is that Western meals come out in a sequence, whereas eastern meals are presented all at once. The cutlery that is used by the different cuisines is the most noticeable part of the two eating traditions for many people. Competency with a chopstick speaks to the ‘foodie’ and well-travelled westerner. There are more shared condiments in Eastern traditions, whereas the consumer drive in the West is for condiments that speak to your individuality. Another significant difference is that cold drinks are served with western meals, and hot drinks are served with eastern meals. For Eastern traditions, this is how they perceive the harmony of the ingredients that are being eaten. It is easy to pull apart the stereotypes of the more communal sharing of meals of the East against the more formal, individual and denuclearised Western meal. In practice, meals still perform an important shared social experience that creates bonds in all cultures. However, particularly in the west, the concept of lifestyle has become much more of a prominent identity marker of individuality, making particular food choices one of the ways we formulate and share our identities in the modern world. Many today belong to dietary tribes of Paleo, Vegan, Omni, etc. as additional ways of creating our identities and demonstrating membership to ways of living. What is interesting is that as the globalisation project continues to develop, many of the boundaries of the regional cuisines are getting more blurred. Hybrid and fusion cuisines have introduced new ways of cooking and are trending back to authentic recipes, now that palates have been trained. Food is still nutrition and this is leading to some big changes from a physiological perspective. E.g. the Japanese have been growing taller from their changes in diets; to the extent that subway doors have had to be made taller. This has been attributed to the high protein western diet. In the 1960’s and 1970’s ‘Early researchers discovered that children born in the U.S. of immigrants were generally taller than those who were born in other countries’. A consideration is that there are health concerns that are closely linked to these physiological changes. In the United States and most Western countries, diet-related chronic diseases represent the single largest cause of morbidity and mortality. These diseases are epidemic in contemporary Westernized populations and typically afflict 50–65% of the adult population, yet they are rare or non-existent in hunter-gatherers and other less Westernized people. Studies such as the China Study, by T. Colin Campbell have also identified differences between western and Chinese diets and correlated these to chronic disease and increases in cancer rates. The question is, is the culinary influence going the right way in a global world? 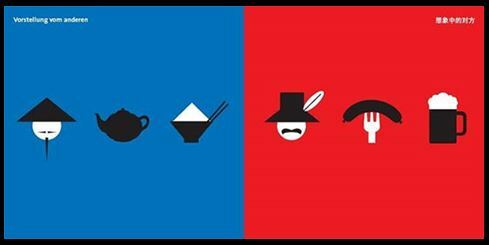 East or West? Mejorad las traducciones por favor.